Illinois offensive lineman Nick Allegretti (53) blocks for running back Reggie Corbin (2) on his way to the end zone during the game against Western Illinois at Memorial Stadium on Sept. 8. No team expects to lose a coach during the season, much less a coordinator. 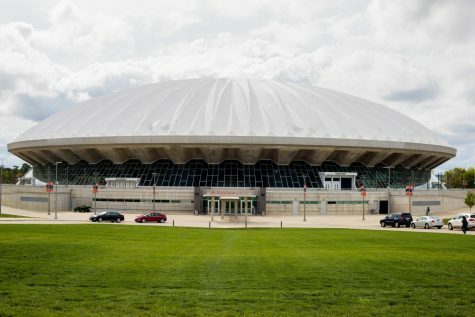 But eight weeks into the 2018 slate, sitting at 3-5 and losing their last three Big Ten games by a combined score of 158-60, that’s where the Illini stand. Now, the team must move on without defensive coordinator Hardy Nickerson, the leader of its 125th-ranked FBS defense. 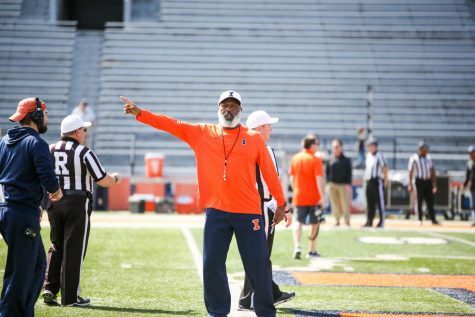 Smith is moving third-year staff member and first-year defensive analyst Rob Wright to take over the linebacking coaching duties, which Nickerson previously handled. Wright was a graduate assistant the past two seasons, after working on Miami’s staff for five seasons. While the offense has improved statistically from 2017 under first-year coordinator Rod Smith, the defense worsened under Nickerson. Illinois has the No. 116 rushing defense and the No. 120 passing defense, two marks that don’t bode well for a team facing Big Ten competition. The Illini are also rated 105th in sacks but are 19th in the country in turnovers gained as of last week’s performance. 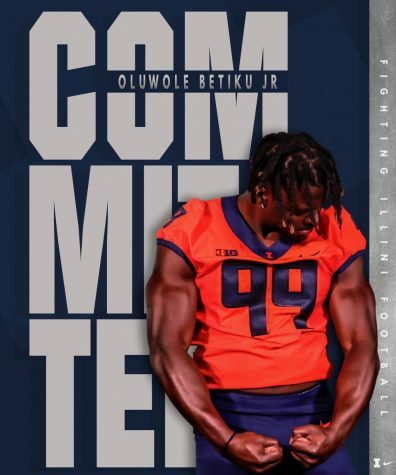 Redshirt freshman Lere Oladipo was arrested early Sunday morning on domestic battery charges — one of domestic battery/bodily harm and two of domestic battery/physical contact. Oladipo pleaded not guilty on Monday in court but was suspended indefinitely from the team on Sunday. 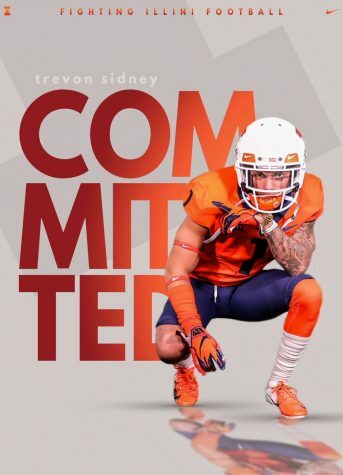 The Huntley, Illinois, native’s pretrial is set for Dec. 21, but the Illini must move on in the meantime. 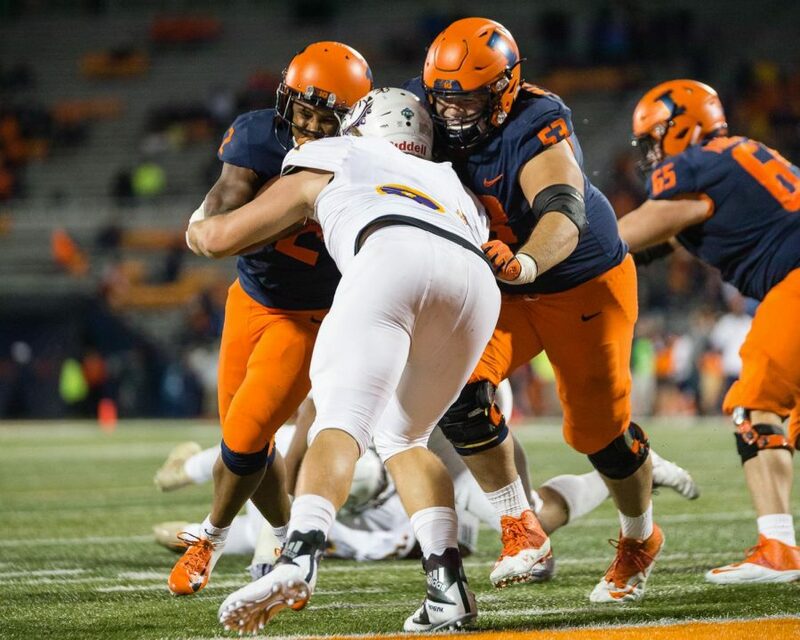 The defensive lineman made his debut against South Florida after missing the first two games of the season with an injury, making three tackles against Wisconsin and one at Maryland. 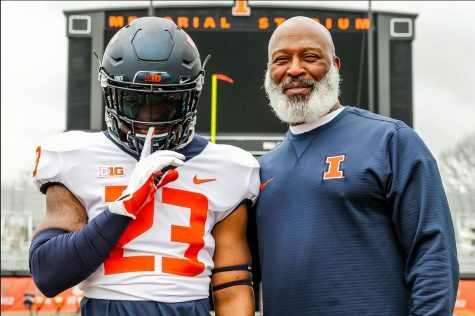 Lovie said at his press conference on Monday he, his staff and the team speak often about how to act as a member of the team. True freshman quarterback M.J. Rivers wasn’t connecting with receivers at Maryland, going 3-for-13 for 45 yards. But matters got worse when former Illini Tré Watson hit Rivers helmet-to-helmet in the second quarter and knocked him out of the contest. Rivers is now going through concussion protocol, but little is known about whether he’ll be ready to play against Minnesota or how long he could be forced out for. If he’s not cleared and healthy for Saturday, graduate transfer AJ Bush will make his sixth start of the season. Rod expressed his comfort in using Bush as the Illini’s quarterback despite having given Rivers the start at Maryland. After Rivers’ injury, Bush came into the game and completed 11 of 19 passes for two touchdowns and 216 yards, though he threw a costly interception in Maryland territory on his third play in the game. Regardless of whether the first-year offensive coordinator has a choice between the two at quarterback, he wants his receivers to step up their production. 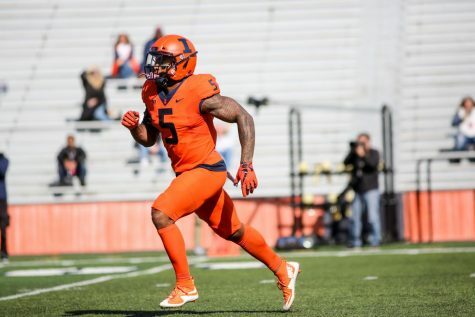 Numerous Illini receivers dropped passes that were catchable at Maryland — it’s been a recurring theme this season. Though Maryland padded on the points and put Illinois away relatively early on, junior running back Reggie Corbin rushed for a career-best 155 yards on Saturday. He broke out for a 69-yard touchdown on one of his 18 carries, the most he’s received all season. That may be in part due to fellow running back Mike Epstein’s injury, but Corbin seized his chance to have a big game in front of dozens of family members and friends who came out to support him in a game just 20 miles from Upper Marlboro, Maryland, his hometown. He gave all the credit for his performance to the offensive line, which was at times able to open up seams for the 5-foot-10, 200-pound back to slip through. However, senior guard Nick Allegretti wasn’t satisfied with his unit’s performance, but he acknowledged there was some positive play. 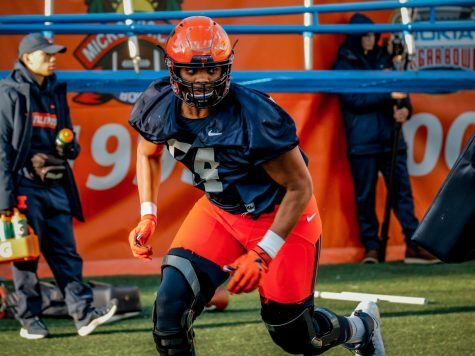 Headed into the season, there was speculation about how the unit would gel together as it lacked proven Big Ten experience and depth in areas, exemplified by defensive line convert Kendrick Green. Through two-thirds of the season, Green and the line have been relatively solid for the Illini. At the very least, the unit hasn’t been one of the team’s major weaknesses, unlike the defense. The offense, especially late in the game, was able to move the ball well against Maryland. 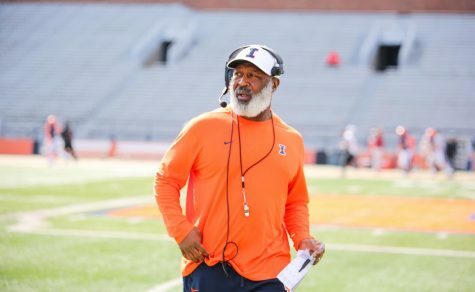 The Illini racked up 493 yards of total offense, averaging 8.2 yards per pass play and 6.6 per run play. 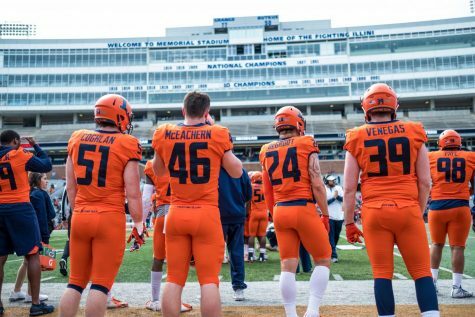 The issue came when Illinois advanced into Maryland territory, too many times coming up short of a touchdown, instead relying on kicker Chase McLaughlin to convert on 32-, 34-, 39-and 26-yard field goals. 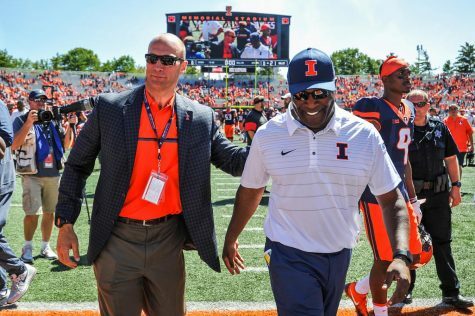 Allegretti knows his guys need to help finish for the Illini to finally get back in the win column.